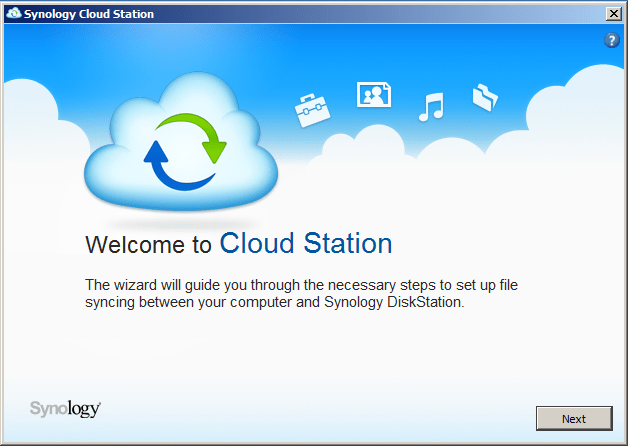 Because of the popularity of my post Synology CloudStation (DSM 4.0) and the final release of Synology DMS 4.0 if written a new post about how to setup Synology Cloud station, this time in English. Whether you are at home or outdoor, your PC always carries important files with the latest versions in a single folder. For that, Cloud Station does the work for you. It may looks like any other folder on your PC, but the Cloud Station folder is actually a private cloud that always prepares itself up-to-date. 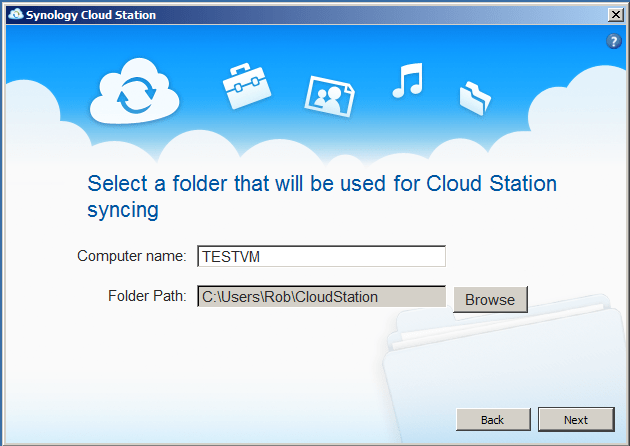 Cloud Station pushes files, songs, and photos to any PC that you are working on, and syncs automatically. View and edit your files anytime you want via the Cloud Station folder even without the Internet connection. You can edit spreadsheets, create a new document, or upload photos all within the folder offline. After Internet access is resumed, all changes will be automatically synced onto Cloud Station and will be ready again for next offline viewing. Your files are made truly available. A single Synology NAS is everyone’s private cloud. Every user can own a Cloud Station folder on their own computers and enjoy all the benefits it has to offer. All clouds sit safe and sound in one DiskStation, where data security and privacy are guaranteed. In addition, when your PC and DiskStation are in the same local area network (LAN), you can also enjoy the speedier transfer rate than what’s offered over the Internet. Large file uploading and syncing just become faster. So it’s a kind of private implementation of DropBox to run on your own storage solution. Now we know what Cloud Station is and we’re convinced we want to run this on our DiskStation we take a look on how to do this. First we have to install the Cloud Station package using the Package Center (found in the top menu). 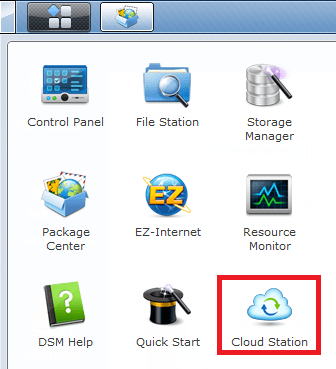 Click the available package tab and locate the Cloud Station package. 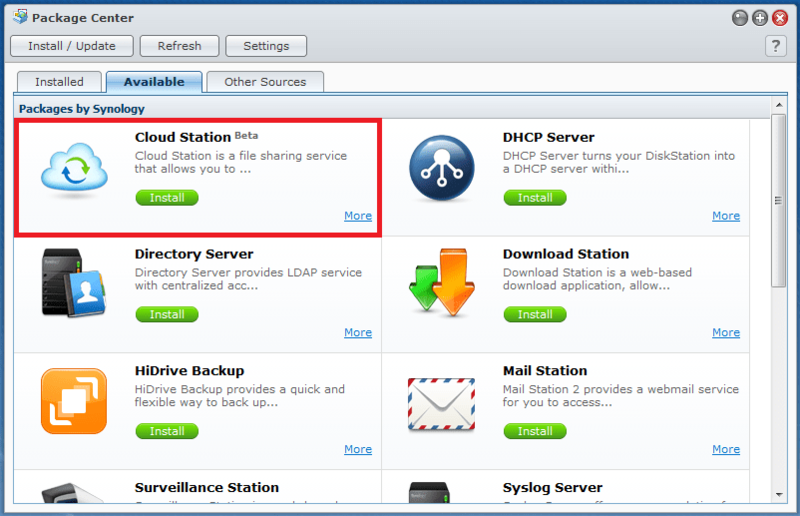 Click ‘Install’ to download and install the Cloud Station package. In the Cloud Station Manager you must first enable Cloud Station by ticking the checkbox in frond of ‘Enable Cloud Station’, then click ‘Apply’ to commit the change. After that we can define witch users may use the Cloud Station services. On the Privileges section, check the users who should have permission to use Cloud Station. After you select them you have to click ‘Save’ on the top to apply the changes. That’s all we have to do on the DS side, now we have to configure the firewall with a NAT rule to forward incomming requests on port TCP/6690 to the Synology DS. The Cloud Station client will communicate with the DS on port TCP/6690, so we have to create a NAT rule to forward this traffic. I’ve made a screenshot of my DD-WRT firewall NAT rule, this may differ from your setup. 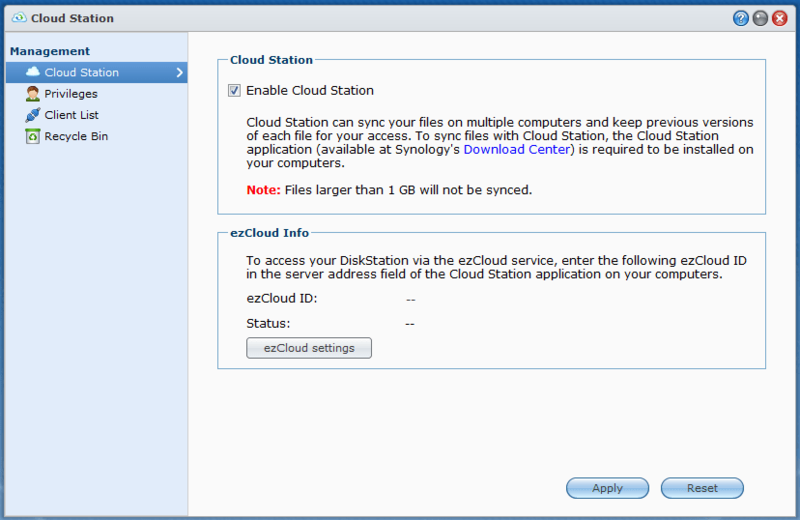 With this rule in place we can continue with the installation of the Windows Cloud Station client. Click ‘Next’ to start the configuration. In this screen you must fill in the public address of your Synology DS and provide your username and password (both are case-sensitive!). In the next screen you must provide a name for this Windows client and select a folder witch Cloud Station will keep in sync. Cloudstation works pretty well for me, thanks for helping us all out with this “tutorial”. I have one remaining question; can I set up two “rules” for synchronization of a single (!) cloudstation folder on my laptop. One for local (LAN/WiFi) and one for distant (WAN/internet). So that synchronization would take place using one or the other rule, depending on my whereabouts ?! I fixed my client cloud station. I renamed my computer and it connected fine. I believe my previous computer named had a database problem on the DS411. Will look at that folder and see what is up there. I had my cloud station working fine on my DS411 with my iMac and MacBook Pro and then I cleaned up some stuff getting rid of some users I didn’t use etc. and renamed a few things. Now I went to set up my client on my iMac and that worked fine and when I went to macbook pro it finds fine with quickconnect , username but after it tests connection I pick the cloudstation folder in my user on the macbook pro and it comes and says Datbase operation fail, please try again!. I can’t seem to figure out why. any ideas. Problem solved, make sure the cloud user has the correct access rights. 2) you can currently only share 2 folders so it is of limited use in a business unless every user wants every file synchronised with their PC e.g. if you have 50 projects does every developer want all 50 projects ? The beta version allows 256 folders but my initial impression of the beta program is not great – there is no forum, just a submit bugs button that has variable response – oh – and once you install the beta software you cannot revert to the production version. Is there a way to get over this problem? My work place have set up cloudstation so that all staff can access their files using cloudstation but when I try to access from home it ‘times out’ and suggests it could be a firewall problem. I have even tried disabling the windows firewall but it still doesn’t work. We are struggling to get the cloudstation working. It continously saying “Bezig met registreren” . Do you know what can be the problem ? I reading on several forums that there is something wrong on Synology servers…. Cloudstation is working fine. But I was wondering. Is Cloudstation using a secure connection to transfer files? 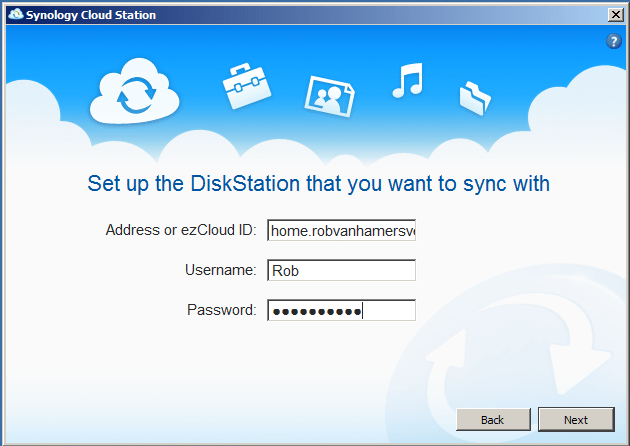 I am using the latest CloudClient for windows: Synology-CloudStation-Setup-2218.exe. Any idea if you can run multiple instances of this software? Actually what I would like is a shared cloud under a specific username so office staff can all access our core files. I would still like to have my cloud under my username and then would like to have a public share for those we collaborate with on a rugular basis. Open to any ideas to make this work as well. Hi Henrik, I don’t know if there will be iOS support for cloudstation. The ds-file app will let you use Apple’s iCloud. Little add-on. If you choose ezCloud settings you can setup a unique name, for example mushroom. If you then install the Cloudclient at your work and insert mushroom as the name the connection will be made. No worries about typing the url or ip address wrong. Works like a charm!